March 17-19, 2017. He was adopted by a dear lady and lives in Seattle! Twenty-two years ago, in the summer of 1996, I created New Avenue Crew with my first teddy bear design. I named my bears New Avenue Crew for my childhood home on New Avenue, and I strive to share the joy of my childhood and my love for art and stories with others through my bears. 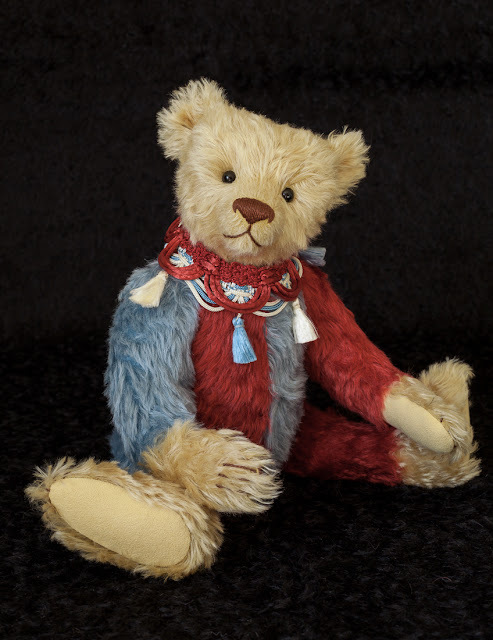 Growing up surrounded by my mother's antiques, I have a special fondness for the traditional teddy bears from Steiff and Bing from the early 1900s, so I create my bears in the traditional style with a bit of New Avenue Crew whimsy. With inspiration from other art forms, God's magnificent creation, storybooks of all kinds, and real live bears, bear design ideas come to me often. I truly enjoy turning a flat piece of beautiful mohair or alpaca fabric into a bear with his or her own personality. I hope you find my bears as lovable as I do. they contain small parts and as such are not intended for children under the age of 12.However, purchasing a teddy bear for a child as an heirloom can instill a lifelong love of handmade art. © 1996-2018, Debora Hoffmann. All rights reserved.